City in the government of Petrokow, Russian Poland, the Jewish inhabitants of which in 1897 numbered 12,500 in a total population of 45,130. Most of the Jews are merchants, only 2,155 being artisans. Of the latter, 801 are tailors and 228 are shoemakers. 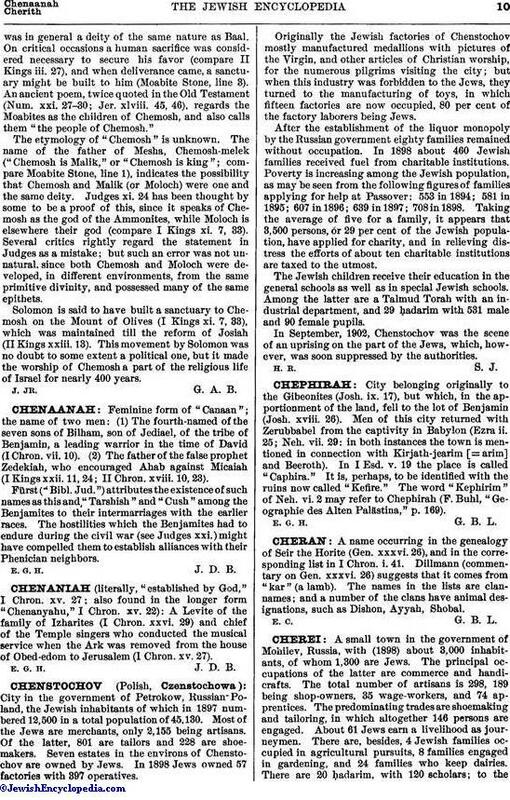 Seven estates in the environs of Chenstochov are owned by Jews. In 1898 Jews owned 57 factories with 397 operatives. Originally the Jewish factories of Chenstochov mostly manufactured medallions with pictures of the Virgin, and other articles of Christian worship, for the numerous pilgrims visiting the city; but when this industry was forbidden to the Jews, they turned to the manufacturing of toys, in which fifteen factories are now occupied, 80 per cent of the factory laborers being Jews. After the establishment of the liquor monopoly by the Russian government eighty families remained without occupation. In 1898 about 460 Jewish families received fuel from charitable institutions. Poverty is increasing among the Jewish population, as may be seen from the following figures of families applying for help at Passover: 553 in 1894; 581 in 1895; 607 in 1896; 639 in 1897; 708 in 1898. Taking the average of five for a family, it appears that 3,500 persons, or 29 per cent of the Jewish population, have applied for charity, and in relieving distress the efforts of about ten charitable institutions are taxed to the utmost. The Jewish children receive their education in the general schools as well as in special Jewish schools. Among the latter are a Talmud Torah with an industrial department, and 29 ḥadarim with 531 male and 90 female pupils. In September, 1902, Chenstochov was the scene of an uprising on the part of the Jews, which, however, was soon suppressed by the authorities.